We've made it simpler than ever to design, order, and install you own dream kitchen. Many people know how they want their kitchen to work. With our market-leading online USizeit feature - Uduit is perfect for you. High quality precision manufactured cabinets and doors, made in New Zealand, huge colour choice, upgrade to our incredible Ultra-Gloss range, handy Assembly videos – it’s easier than you think. When you’ve worked out your design it’s simple to generate a quote to check out your costs. Dispatched in 7 days, delivered to your address, step-by-step assembly instructions - It’s just a matter of getting started! The perfect solution for the Home Handyman undertaking Kitchen renovations. If you’re handy with the tools, and you can plan and install a kitchen, then this is the way to save money, and get top quality cabinets. To keep the money in your pocket - UDUIT is a 100% online service. It means there is absolutely no one in between you and the Manufacturer. No middlemen, no merchants, and no expensive advertising. All questions are answered by email. All orders are placed by you on the website. We keep the service as efficient as possible without compromising service or quality. The site provides the information and solutions that you need when undertaking DIY kitchen renovation. It provides information on where to start, and tips to help you plan the perfect kitchen. 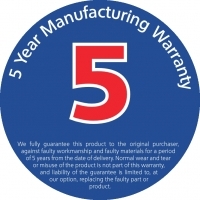 UDUIT Kitchen cabinets and doors come with a 5 year manufacturing warranty against any defects in workmanship or materials.As a business relying on happy customers and referrals, UDUIT relies on your project being successful. UDUIT is a long-established New Zealand manufacturing expert. Our cabinets and doors are precision manufactured from quality materials. All board is sourced locally, and we deal with hardware suppliers who will stand behind their products for 5 years like we do. UDUIT will repair or replace any defect resulting from faulty materials or workmanship in the products we supply you. If there is a problem we have caused we'll sort it out quickly. Once you place your order and payment, your Flat Packed cabinets and doors will be dispatched to you within 7 working. Once dispatched, the trucking company will contact you to organise a delivery time. and we recently introduced 4 Woodgrain colours. PS If you like a colour that isn't in this range, don't forget to enquire about it). All doors and panels are manufactured to order, not waiting in warehouses, or stores getting dirty or damaged. When ordering, to select your colour click first on door design - select one of the 3 ranges described above - then select your door colour. Go to our Colours and Specs page to see screen representations of the colours, or email sales@uduit.co.nz to request samples. For those who are able to cut and join their own benchtops, Uduit has very affordable Benchtop Blanks in popular colours. See more detail on our Colours and Specs page, or go to the Benchtops section in the under SHOP MENU. Also enquire to sales@uduit.co.nz for cut to length blanks, or 37mm Formica colours. If you are less confident about cutting and fitting a benchtop, we recommend installing your cabinets first then getting your Benchtop measured and fitted. Most problems we have seen with DIY installations relate to incorrect measurements of the Benchtops and cutouts. The Benchtop is one of the most expensive items so you want to take your time to get it right. Trying to calculate how the top fits over cabinets and the sink cutout can be tricky, especially if your room is out of square. For these reasons we recommend contacting a local Benchtop fabricator to measure up, quote. deliver, and install. UDUIT has tools that assist you in planning your kitchen. Consult our UDUIT DIY Flatpack Kitchen Guide download to assist planning before you order and after you receive your delivery. This includes the pantry and the fridge. It may not be possible to group the pantry and the fridge together, but both should be in a convenient position for putting the food away when it arrives home from the supermarket, and to and from the preparation area. Your principal cooking appliance needs to relate well to the sink, as water and heat are always interacting in cooking. This area also requires landing areas for hot pots and dishes alongside the oven and cook top. It is important that the microwave is no higher than eye level as this makes pulling out hot dishes much easier. This area needs to be on the other side of the cook top from the sink so it is not in the way of other areas. Plates, cutlery and serving dishes can be stored in this area. This area includes the sink and dishwasher. This can be a separate area to the preparation area or incorporated into it. The important thing to remember is that both areas need to flow and work together. Additional areas such as baking or breakfast areas can be created to suit your needs. It is important that these areas work well while not disrupting the main centres. Even those main centres are not exclusive to each other but share elements, appliances and space. b) Measure your room using a metric tape measure in millimeters. This gives you the most accurate measurement. Check to see if the room is out of square by measuring from the corner of the room 1200mm out toward the centre of the wall and mark the spot. Starting from the same corner measure along the other wall 1600mm, and mark the spot. The measurement between these two marks should come to 2000mm. IF it is under or over your room is out of square. You need to be aware of this in your design, and particularly as you install your cabinets. c) Draw your walls onto your plan. Measure all windows in height and width and mark on your plan. Draw in the position of light switches, lights, plugs and plumbing. d) Now you can start to lay out the cabinets in place. The easiest way is to start in the corners and work your way into the centre of each wall. Plan out the base cabinets and pantries first. e) Remember to allow space for any appliances. For a free standing fridge allow an extra 20mm either side (the benchtop overhanges 10mm back towards the fridge). For a free standing oven allow a 5mm gap either side (with 2.5mm benchtop overhang). f) Once you have your base cabinets in place, add in your wall cabinets and utility cabinets. g) Any exposed cabinet ends require a coloured end panel. These are 16mm thick in most cases. Make sure you allow enough room to include them. h) When you have finished check your plan against your checklist. Does your design cover all the points in your checklist? Is the kitchen user friendly? Does it look attractive? If you are not happy with any part of it, change your plan now! Better to spend more time planning it right rather than rushing it and getting it wrong! a) You will need to allow 1 full day to remove your old kitchen fittings. 1-2 days to assemble and install your new kitchen. This does not allow for any structural changes, repairs to walls, paintings or laying the floor etc. b) Make sure you have all the tools you need. A battery drill with Phillips head bit #2, and a good spirit level are musts! c) When will you do the installation e.g. Will you take time of work or will you do it in the weekend? e) You will not be able to cook etc while the kitchen is being installed. What will you do for meals and washing dishes? (Takeaways, B.B.Q., go to a friend’s house, or family member?). f) To minimise the downtime, you need to organise the plumber and the electrician for the second day of the installation. This way the kitchen can be in working order by the end of the day. Any necessary painting can be completed after this time if required. Take it to the local dump – you will require a trailer for this. You will need to allow for disposal costs. Use it in the garage, basement, bach.